This gorgeous home was a collaboration with Sier Developments in Wortley Village in London, On. The kitchen keeps it classic with soft white perimeter cabinetry in Polar White and a dark stained island in Charcoal. The custom hood was designed and built in Casey’s London shop and creates a simple yet commanding presence in the space. Silestone’s Calacutta Gold countertops keep this home on-trend by using a quartz product that looks like marble but have the durability and strength of quartz. London, Oct 23 2016 — Brianne Hughes has been selected as one of the 30 Under 30 recipients by The National Kitchen & Bath Association (NKBA) for the Kitchen & Bath Industry Show 2017 (KBIS®), to be held January 10-12 in Orlando. Casey’s is very excited to be hosting our first ever Sarnia Ladies Night at our Sarnia showroom! Our showroom is going to be filled with great local companies who will be showing off their wares and mingling with guests. You’ll get to sample some delicious food and drinks, and of course hang out in some very ‘creative’ kitchens! It’s a wonderful opportunity to meet new people and see many of the things that our community has to offer, all in support of a great local charity – Noelle’s Gift. Waterloo, December 4 2015 — Benjamin John Ouellette has been selected as one of the 30 Under 30 recipients by The National Kitchen & Bath Association (NKBA) for the Kitchen & Bath Industry Show 2016 (KBIS®), to be held January 19-21 in Las Vegas. FREE Granite Upgrade with Donwest Custom Homes! Have you ever dreamed of having granite in your new kitchen? Would you prefer hand-picked slabs from countries around the world, including Italy, Brazil and even India? Would you prefer it to be free? What if we told you that you could have all of the above? Sound too good to be true? Well we’re here to tell you it’s not! Donwest and Casey’s Creative Kitchens invite you to take advantage of our “Too Good NOT to Be True” spring sale event! Granite and Quartz In-House Fabrication! Did you know that Casey’s Creative Kitchens fabricates granite and stone in-house? Many of our customers do not realize this when they come to see us. The industry standard for kitchen cabinet companies is to outsource countertops to an outside supplier. They will provide you with a design and quote for cabinetry, and then have one of their suppliers quote the granite/quartz, resulting in less control of the process and higher mark-ups passed on to you, the end consumer. Casey’s Creative Kitchens is growing again! We are looking for an experienced Kitchen Designer for our London location! Are you a creative individual with a passion for design? Then this is the role for you! Casey’s Creative Kitchens is a local leader in the kitchen industry, with 5 locations across Southwestern Ontario. For 35 years we have developed a brand that stands for superior designs and quality workmanship. Our designers work closely one-on-one with clients to bring their dream kitchen to life! 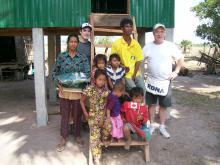 They have the added benefit of a large 3500 sq. 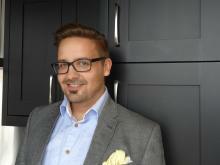 London's Best Kitchen Renovator 2012!!!! THANK YOU LONDON!!!!!!!!!!!!!!!! 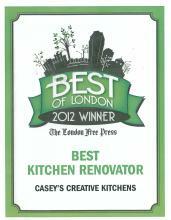 We are so honoured to be voted London's Best Kitchen Renovator in the premier edition of the London Free Press. Our goal has always been to provide our customers with an outstanding kitchen renovation experience. This acknowledgement sure says we are doing something right!! We thank our customers for voting to give us this award and we look forward to serving this great community for many years to come! CCK's Waterloo Showroom Grand Opening Gala!!! On August 27, 2011 we celebrated the completion of our brand new Waterloo showroom with a fun-filled gala event! An invitation was extended to all our staff to come out and see the new location. They arrived in style via a limo bus which picked them from London and brought them to Waterloo - by the time they arrived the bus was rockin'!! !